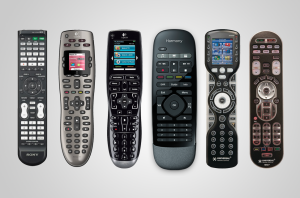 My Dad, who loved electronics, had a whole array of remote controls that only he knew how to use! Once upon a time, I used to get the biggest kick out of watching my mother try to operate anything more complicated than a can opener. When I was 12-years-old we bought our first VCR, a rudimentary model with a corded remote no bigger than my palm and buttons so clearly labeled that anyone with thumbs could operate them. Anyone, that is, except my mother. Unfortunately, the geniuses that designed the thing put the power button below the TV/Video button and if one made the mistake of turning these two things on from the top down rather than the bottom up, it would take all day to get them in sync. I literally laughed so hard I cried watching her rage against the machine that held The Thornbirds hostage.